Sweet potatoes truly are delicious and nutritious. Originally grown by Native Americans, they were the main source of nourishment for colonial settlers and soldiers during the Revolutionary War. They are an excellent source of vitamins A and C, and they’re also full of carotenoids like beta-carotene. These antioxidants can help prevent some types of cancer and heart disease, and promote a healthy immune system and good vision. And what better way to get those benefits than by eating fries? Of course, these ‘fries’ are actually oven-baked – but they’re just as delicious. Try serving alongside our tasty turkey burgers, or lentil veggie burgers for a vegetarian meal! 1. Preheat the oven to 425°. Peel the sweet potatoes if you prefer (the skins make it crispier) and then slice them into strips. The thinner your strips, the faster they’ll cook. 2. 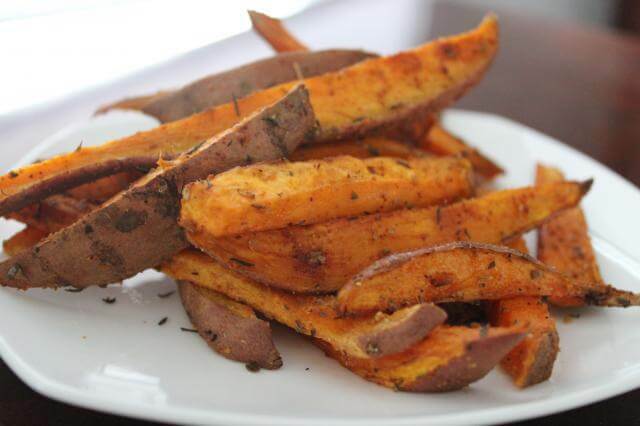 Put the sweet potato strips, olive oil, and spices into a plastic bag and shake to coat. 3. Line a baking sheet with foil and spray with cooking spray. Place the sweet potatoes on the sheet in a single layer and bake in the preheated oven for 30 minutes, flipping halfway through. Increase the temperature to 500° and cook for an additional 5 minutes. Serve!